It would appear that I haven't reviewed as many facial creams as I first thought. I was surprised because I use a cream every day but then I realised the reason for this is I stick to the same ones. Pai Chamomile & Rosehip Calming Day Cream is a staple in my collection and the product I buy most often, closely followed by Antipodes Rejoice Facial Day Cream. If you have eczema then it is worth checking out Kris D'Amour, B Skincare Aloe Vera Moisturiser, Barefoot SOS cream, PHB Gentle Moisturiser and Green People Scent Free. For those that like multi purpose products not only is Lyonsleaf Beauty Balm a moisturiser it also doubles as a cleanser. I cheated with the Herbfarmacy Pure Hydration Serum but I found this product can be used alone or under another cream. 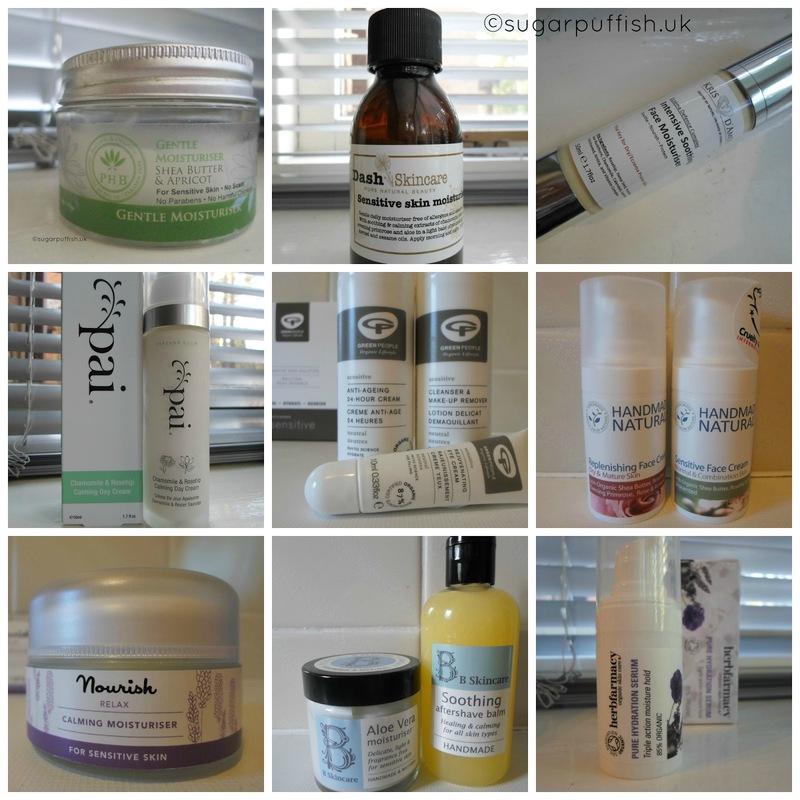 Other reviews which you may like to browse are Dash Sensitive Skin Moisturiser, Nourish, Trevarno, Elizabeth's Daughter, Cupcake Organic, Lavera, Balance Me and Odylique. I would certainly like to try expand my knowledge of face creams so if you have a recommendations leave a comment below. Fun to read your list. Most recently I've been using a few things I like very much. The first is a moisturizer from Twelve Skincare called Essential Bio-Technological (a mouthful). I purchased at Content Beauty and they told me the products were developed for people with sensitive and reactive skin. I really like it and it has never irritated my skin at all. I sometimes pair it with Ak'in rosehip oil (my favorite brand because if smells so good). The moisturizer feels light and not at all oily and probably would suit my skin for the warmer months if I was using it on its own but it's nice with the rosehip oil in colder weather. Just in the last two weeks I've tried a different routine that I've been very, very happy with - using Osmia Active Gel Toner under either the rosehip oil and skipping the moisturizer. The Osmia gel seems to really combat dryness and it's great. The other thing I've been using occasionally is the Blissoma Lavish Mask and this also feels really moisturizing. It's been quite cool for Northern California the last couple of weeks so I've been playing around with different routines.